CLASSIFIED ADS: RESTAURANTS SANGUINI'S: A VERY RARE RESTAURANT IS HIRING A CHEF DE CUISINE. DINNERS ONLY. 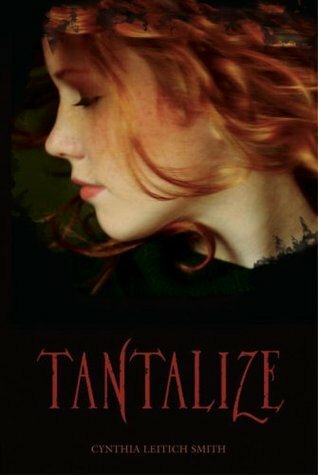 Tantalize had so much potential to be a completely amazing and unique book in the vampire world, but I felt that it just didn't do it. I was confused most of the time, and felt it took me longer to read Tantalize than it normally should. The concept is great--a vampire themed Italian restaurant wrapped up in a supernatural murder mystery. But the murder mystery is never even looked into. The fact that the first chef was murdered in the restaurant is basically brushed aside, when I thought it could've added way more suspense and intrigue to the novel. Also, the romance, well, wasn't romance-y. It was supposed to be a love triangle between Quincie, the new young and cute chef she hired, and her best friend who also happens to be a werewolf. The problem is that Mr. Werewolf Bestfriend only stops by a few times throughout the novel for a quick argument, and then leaves again, all culminating at the end with an even bigger argument. And Mr. Hot Chef, well, I didn't really know what to think of him. My opinion of him changes several times throughout the book, and at the end I was just kinda like ".....Okay then." The plot didn't do much for the first portion of the novel. There comes a moment where something monumental is revealed about one of the main characters, and only from there do things pick up. But it just took too long to get started. I do think that Cynthia Leitich Smith has a great writing style, and was able to paint a vivid picture with her prose, though. Even though I wasn't too keen on Tantalize, I will read more of Cynthia's work. Even if I don't like the first book in a series, I always give the benefit of the doubt and continue on for at least one more book. Overall, I give Tantalize 2 out of 5 stars. I think it's a good idea of continue with book 2 and give a series another shot. I feel like that with City of Bones. I didn't really enjoy it but I was to try it out again. I read it right after Mockingjay and I don't think that was very fair to that book. I'm sorry Tantalize didn't do much for you. I read it a long time ago when I won it in one of my first contests when I first started blogging back in '06. I really want to read it again, though. Back then I didn't really point out much in my reviews, haha. Great review! Hope you read the second book, it was pretty good, though really weird from the first. It's not the same characters, but set in the same world.